crafted together with fine dovetail joints, this cajon is a work of art. finely adjusted to the drummers requirements. Pro model and the deluxe sound exactly the same, a real punchy bass and cracking snare. My snare design allows the drummer to dampen the snare when hitting the bass. This isolates the snare giving the bass a pure tone, almost free of snare sounds. You can here the distinct separation in the sound file below. "Just had my first play of the Cajon with guitars and vocals backing me up. To say it sounded amazing is an understatement. I really got a true feel for it. The fractional difference in hand placement when hitting really impacts the different tones of the snare. Consistency is definitely something I'm going to have to work on. All my mates were in awe of the depth of tone that this beautiful thing has. I'm over the moon mate. I can't thank you enough for building this for me. It's fantastic. " made with dovetail joints this drum can support up to 150 kg+ in weight. The drum has a fantastic deep bass, rich mid tones and a bright crisp snare. made to last for a lifetime if treated with respect. 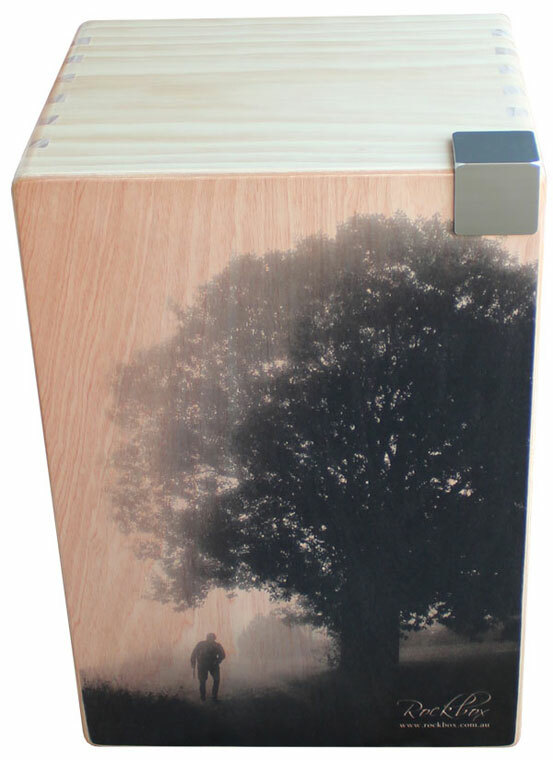 My hope is that the Dovetail model cajon will be passed down from generation to generation. Above: detail view of dovetail joint Rockbox deluxe construction. Meaning if you put your hand through it while playing it's not under warranty. no reason to touch it once in tune, so I suggest don't. creating a rattle, rather than a crisp snare sound. Which side do you need the snare positioned? pretend you are playing a Rockbox. on the middle of the drum. Which hand would you naturally use to lean over and hit the bass? If it's your right hand, the snare gets placed on the left side. then the snare is positioned on the right side.